The Peacekeeper missile has played a key role within the U.S. strategic modernization program. With the end of the Cold War, the U.S. has agreed to eliminate the Intercontinental Ballistic Missile (ICBM) as part of the strategic arms reduction treaties with Russia. The rocket may have a second life - hurling U.S. university payloads into Earth orbit. BIGSKY, Montana - University-built space payloads may get a lift from deactivated intercontinental ballistic missilesthat are now on a trajectory for the scrap heap. The idea is to utilize thePeacekeeper missile, phased out under mutual nuclear arms reduction agreementsinked between U.S. President George W. Bush and Russian President VladimirPutin. Themissile's Cold War mission came to an end earlier this week, after serving 19years as a key part of U.S. nuclear deterrence strategy. The mothballing of thePeacekeeper is part of a reduction in U.S. missile forces from 6,000 to between1,700 and 2,200. Russia's Putin agreed to pursue a similar course of action. ThePeacekeeper began its development back in 1979, and some nine years laterbecame fully operational. According to the U.S. Air Force, each Peacekeeper wasbuilt at a cost of about $70 million. The deactivation is estimated to save theAir Force more than $600 million through 2010. Peacekeeperwas designed to carry up to 10 independently targeted warheads. But now theycould be tipped with student-built research gear. Ratherthan mothballing and ultimately destroying dozens of the Peacekeeper missiles, Republican Congressman DennisRehberg of Montana is championing steps to use the weapons to lob universitypayloads into orbit. Rehbergadvanced the idea during the Inland Northwest Space Alliance (INSA) Space Policy Institutemeeting, held here September 16-18 that involved NASA officials, academia andindustry experts. The Missoula-based INSA isa private group created by the University of Montana in 2003. The group isfocused on broadening space-related research and commercial applications,particularly in the inland northwest. "Wouldn't it be better totake the same amount of money and those missiles to provide the opportunity forthe university system to shoot them up into space," Rehberg said, armed notwith warheads but student experiments. "Wouldn't that make a lot more sense?" Rehberg said that there'sno reason for the U.S. government or the Department of Defense to destroy therockets - typically done by junking them up on the ground. "Because, ultimately,they're going to be destroyed under the non-proliferation treaties that we'vesigned," Rehberg told SPACE.com. "We have the opportunity to do this asefficiently and effectively as possible. Don't spend the money on destructionof the missiles. Let's use them to get some research done and provide anopportunity for the university system," he explained. The lawmaker serves on theEnergy and Water Development, Military Quality of Life, and Foreign OperationsAppropriation Subcommittees. Rehberg said that he is teaming with fellowcongressmen, Chet Edwards of Texas and Rodney Frelinghuysen of New Jersey, todelve into the Peacekeeper use within the arena of non-proliferation. The idea of using surplusCold War weaponry to hurl student satellites into orbit is not new. Just askthe Russians. U.S. university payloads, among other groups, have found home onthe Dnepr booster under contract with ISC Kosmotras, a Russian and Ukrainianrocket-for-hire company. Kosmotras was founded in1997, converting retired R 36-M ballistic missiles into the silo-launchedDnepr space booster. 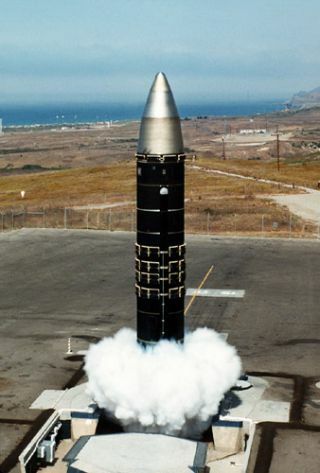 The R 36-M is known to the West by its NATO classification-- the SS-18 missile. ScottSchoneman, manager of mission development for Orbital Sciences Corp. inChandler, Arizona, detailed the firm's focus on the Peacekeeper as a newaddition to the U.S. Air Force's Orbital/Suborbital Program (OSP). He managesthe company's Orbital/Suborbital Program within the Launch Systems Group. OrbitalSciences, headquartered in Dulles, Virginia, has already developed the four-stageSpace Launch Vehicle (SLV) Minotaur rocket using a combination of U.S.government-supplied Minuteman II motors and Orbital space launch technologies. Anew addition to Orbital's line of space launch vehicles is the OSP-2 MinotaurIV Space Launch Vehicle. That booster melds elements of government-furnishedand decommissioned Peacekeeper boosters with technologies from the group's Pegasus,Taurus, and OSP Minotaur line of launch vehicles. TheMinotaur IV consists of three Peacekeeper solid rocket stages, a commercialOrion 38 fourth stage motor and subsystems derived from Orbital's already establishedspace launch boosters. Under a 10-year contract with the U.S. Air Force Spaceand Missile Systems Center, Orbital is developing and would operate the MinotaurIV vehicle to launch U.S. government-funded satellites into low-Earth orbit. Schonemansaid that the Peacekeeper-based Minotaur IV would be capable of being launchedfrom multiple spaceports: California, Florida, Alaska, and fromVirginia-situated Wallops Island. MinotaurIV would be able to loft payloads on the cheap, Schoneman said, making it thelowest costing ride into low Earth orbit of "any existing, real, small launchvehicle." Concerningthe rocket's use to haul student payloads - given a backlog of universitypayloads ready for rides -- Schoneman advised that the launcher would enableuniversities to, hopefully, acquire good science..."but at least get them flownand not have hangar queens sitting around." "Usingthe Minotaur IV to launch a number of university payloads is an excellent useof decommissioned Government assets, allowing us to provide a low cost,reliable launch that will also provide great educational benefits to thestudents involved," Schoneman added. Whenwill the Minotaur IV be ready for action? has been pushed beyond the original 2007 launch date, he said. configuration," Schoneman told SPACE.com. "Given the advanced state ofdevelopment, along with the proven heritage and maturity of the constituentelements of the launch vehicle, we could realistically be capable of launchingwithin 18 months of receiving funding of an additional mission." The INSA meeting showcaseda growing and sophisticated array of university small satellites. But foryears, finding affordable rides into Earth orbit for the home-grown satelliteshas been elusive. Students as the "feedstockof the future" was a recurring theme during the INSA confab. Moreover, student access tospace is a critical piece to training the next generation workforce, emphasizedDavid Klumpar, Research Professor and Director of the Space Science andEngineering Laboratory at Montana State University in Bozeman. "It'simportant to have folks coming out of our colleges and universities that havedirect, hands-on experience," Klumpar told SPACE.com. "It isn't goodenough to do design studies that don't result in hardware," he said. Klumparsaid something must be done to deal with the retiring aerospace community thatthe nation now faces. Having students design, build, and then fly theirhardware is vital to help counter this issue, because "it's where the rubbermeets the road," he added. Thatview is backed by INSA CEO and founder George Bailey. He senses that studentaccess to space is part of a much larger issue of the nation's wellbeing. "Student-ledpayloads have stalled...and it's putting our country at a national security risk.Getting student payloads back in space is a way to develop the next generationof space scientists and aerospace engineers," Bailey concluded.